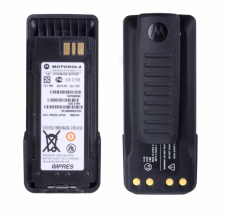 The Motorola DP4401Ex ATEX battery is backed by decades of experience in battery technology. ATEX-certified for use in mines and other environments containing gas and dust, these high-tech cells are just as reliable as the tough case that holds them (and the case easily attaches to the back of the Motorola DP4401Ex ATEX). In demanding work environments, efficient communication is important, but worker safety is paramount. That's why it's a good idea to always have reliable, tested replacement batteries on hand in hazardous workplaces. With its high-tech cells, the DP4401Ex ATEX battery is just as sophisticated as the Motorola DP4401 two-way radio. Even with protective gloves on, it's easy to attach the battery pack to the back of the handheld two-way radio. To ensure employee safety in potentially explosive environments like chemical plants, mines, oil platforms, pipeworks and paint shops, keep at least one fully-charged ATEX replacement battery on hand for every shift. Use our online quote-request tool now to rent the right batteries for our Motorola DP4401Ex ATEX. Simply click on the "Request Rental Quote" button. We'll gather all the information we need for your quote in three simple steps. You can then go on to add two-way radios and headsets and get a quote online.